The King County Medical Examiner’s Office on Tuesday identified 44-year-old Alexandru Culai as the Bellevue man killed Monday by a street sweeper outside a major construction site on Northeast 120th Street. Bellevue police say traffic-camera footage shows a pedestrian was kneeling down, possibly to tie his shoe, when a street sweeper backed up over him Monday morning, fatally crushing him. The pedestrian was identified Tuesday as Alexandru Culai, 44, according to the King County Medical Examiner’s Office. He died from blunt-force injuries to his head and chest, and his death has been ruled an accident. Traffic-collision investigators are still reviewing the traffic-camera footage of the incident that happened just before 11 a.m. on the street outside a construction site in the 1300 block of Northeast 120th Street, police spokesman Seth Tyler said. 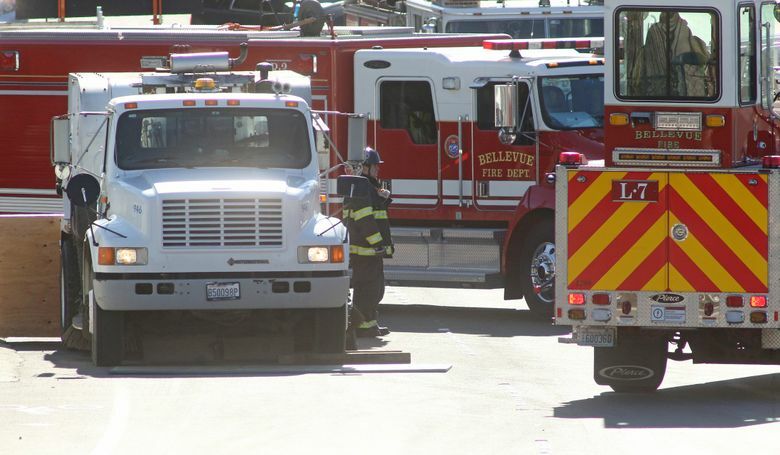 “It appears the sweeper was backing up, and the pedestrian was kneeling down, possibly tying his shoe or something like that,” he said of Culai, a Bellevue resident. The street sweeper was equipped with a backup camera, but Tyler said he didn’t know if it was working or if the 67-year-old driver was using it as he reversed. Tyler didn’t know whether the street sweeper had an audible backup alarm. Police do not suspect that the driver was impaired. The police investigation into Culai’s death is likely to take several months, Tyler said. The state Department of Labor & Industries is not involved in the investigation because the fatal collision happened on a city street, he said. There is no sidewalk along 120th Avenue Northeast near Northeast 12th Street where a large apartment building, taking up a city block, is being built by Rafn Co., Tyler said Monday. The building’s address is 1375 121st Ave. N.E. The driver works for a private company, Woodinville-based Enviro Clean Leasing. The firm was hired by a subcontractor working on excavation, according to Rafn Vice President Heather Bunn. A woman who answered a listed phone number for Enviro Clean Leasing on Tuesday took a message, but a reporter’s phone call was not returned Tuesday. According to Tyler, it is a permit requirement to hire a street sweeper to clean up dirt and debris that gets deposited on city streets by trucks leaving major construction sites. Culai’s ex-wife, Carina Culai, said her sons — Teodor, 14, and Daniel, 8 — are devastated by the death of their father. Her ex-husband’s second wife is eight months pregnant and is expecting a boy, she said. Alexandru and Carina Culai, who divorced in 2015, met at church in Moldova’s capital city, married in 2001 and moved to the U.S. in 2006 in a green-card lottery, she said. Alexandru Culai — pronounced “cool-eye” — was a professional Christian singer and composer and at one time had a recording studio in his house, according to his ex-wife, who lives in Redmond. After their divorce, Alexandru Culai became a long-haul truck driver, she said. He had just returned from a trip and had gone to his apartment, located close to the construction site, to change clothes when he told his roommates he needed to check something on his truck, Carina Culai said. He was walking to where he’d parked his truck when he was struck and killed, she said. “He was a caring, loving father. He liked kids and he helped a lot of people,” said Carina Culai. A GoFundMe campaign has been started to help raise money to cover Culai’s funeral expenses.